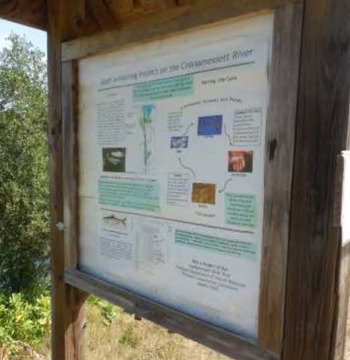 The Falmouth Conservation Commission (ConCom) and The 300 Committee Land Trust (T3C) have shared a long-term goal of creating a Coonamessett Greenway Heritage Trail (CGHT) along the Coonamessett River from Coonamessett Pond to Great Pond. In 2017 a $2.5 million conservation effort along the River was in progress, with support from state and federal grants, including a $430,000 restoration grant from NOAA (National Oceanic and Atmospheric Administration), as well as in-kind support by the Town and local nonprofit organizations. The work will improve habitat not only for the five species of diadromous fish that use the river (herring, blueback herring, American eel, brook trout, and white perch), but also for other species of plants and wildlife, greatly improving the ecological functions of the river valley. In 2016 the ConCom-T3C partnership was ready to move forward with Phase I of pedestrian public access improvements along the Greenway and asked for $137,164 in CP Funds for (1) conceptual planning for the Coonamessett Greenway Gateway Park, and (2) construction of two bridges and walkways over the wetlands to provide pedestrian public access in the Lower and Middle Bog Areas. April 2017 Town Meeting appropriated the requested funds and Phase I planning and construction began. The project schedule calls for completion of the Gateway Park and bridges by September 2019 at the latest. The total Phase I project cost of $193,964 is covered by a $55,000 Massachusetts Environmental Trust grant, and in-kind services from the Department of Public Works, in addition to the grant from the CPFund. The Coonamessett corridor has a long history of varied land use as the Falmouth economy changed over time, from early days as an important sustenance for Native American people, to its agro-industrial history as a site of grist mills and then woolen mills, as well as sheep and cattle farming, to a more recent history of cranberry cultivation, recreation, and fishing. The valley provides a visual history of how and why land use changes through time, and the Heritage Trail project intends to highlight natural, cultural, and land use history for visitors of all ages. The Trail will provide passive recreational opportunities such as hiking, birdwatching, fishing and fish watching, dog walking, photography, picnicking, and so forth. There will also be a sheltered open-air amphitheater for public gatherings in the park. Much of the greenway trail system will be created and maintained with volunteer labor. During the summer of 2015, high school students, college interns, and land management technicians from ConCom and T3C performed the preliminary mapping and identified possible waystations along the trail. Throughout the construction of the Trail and Park, ConCom and T3C will collaborate with groups such as the Coonamessett Pond Association, Coonamessett River Trust, the Botanical Club, the Falmouth Preservation Alliance, among others. The landscape architect for the project will incorporate granite blocks from the 1800s woolen mill into the Park’s conceptual plan. The earlier phases of trail construction focus on the trails along the 3.2-mile length of the River from the Souza and Dupee parcels on the northern end of the River bordering Coonamessett Pond to the Lower Bog parcel in the south. The long-range plan is to extend the Heritage Trail on the northern end so that it travels around Coonamessett Pond and continues north through State conservation lands to the Falmouth Town border. Eventually, with additional funding, the Trail will include ten waystations at sites near the River with kiosks built by local students to display story boards of cultural and natural heritage. The Trail includes land use sites such as the River Bend Silo, the historic dairy barn in the Dupee Conservation Parcel, the mill sites, cranberry bogs, and other existing examples of historic land uses. There are also opportunities for learning and observing natural history, such as water and other birds of the Coonamessett Valley, fishes of the Coonamessett, a history of fishing at the River, and the life cycle of herring.